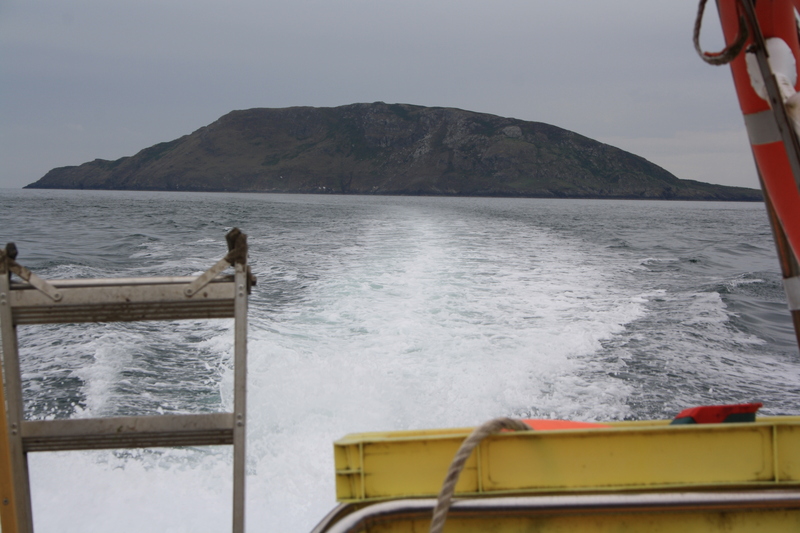 Four and a half hours is not anywhere near enough time to begin to explore Bardsey Island, but still that’s the time allowed for on the day trip ferry service and it is four and a half hours better than nothing. However, readers will have to accept that this piece is necessarily a preliminary and very cursory view of the wells of the island. There are inevitably going to be errors and omissions and I hope that you will bear with them. As always i entreat comments, information and corrections through which I hope to clear up loose ends and better plan my next visit. Our crossing from Porth Meudwy was less ceremonial, despite that day being filmed by a German television unit for something like their equivalent of the “Coast” programme, though even still it was probably much quicker and less hazardous than that which may have been experienced in centuries gone by. The Welsh name for Bardsey is Ynys Enlli – island in the currents, referring to strong and often dangerous seas which surround it. Bardsey as a community turns its back on the mainland, looking out over open sea. The mountain on the landward side hides all traces of the rest of Wales from view. Once on the island it becomes very easy quickly to forget that anywhere else in the world exists; maybe this was the attraction to the early settlers when the first monastery was set up. Cadfan is often credited with the establishment of the first monastery on the island although it was probably established earlier in the mid fifth century. This establishment was the lure of the early saints. Its importance, and population, is said to have grown following early 7th century Saxon attacks on the major monastery at Bangor-Is-y-Coed near present day Wrexham. This monastery declined around this time and surviving monks may have fled westward and may have eventually settled at Bardsey. The buildings preserved today are part of the thirteenth century Augustinian Abbey of St Mary’s which flourished right up to the dissolution in 1537, after which Bardsey was largely abandoned until the establishment of a fishing and farming community in the eighteenth century. Bardsey has featured in so many of the well stories we have encountered across North Wales. It seems that almost every saint wanted to see out his days there, and thousands of ordinary people took part in the pilgrimage to the island, a well worn trail that leaves its mark to this day down the length of the Llyn Peninsula and which boosted the fame and economies of so many of the communities through which it passed. Obviously wells are important here too, without them life on the island would not have been possible, and its importance as a monastery and place of pilgrimage would never have begun. 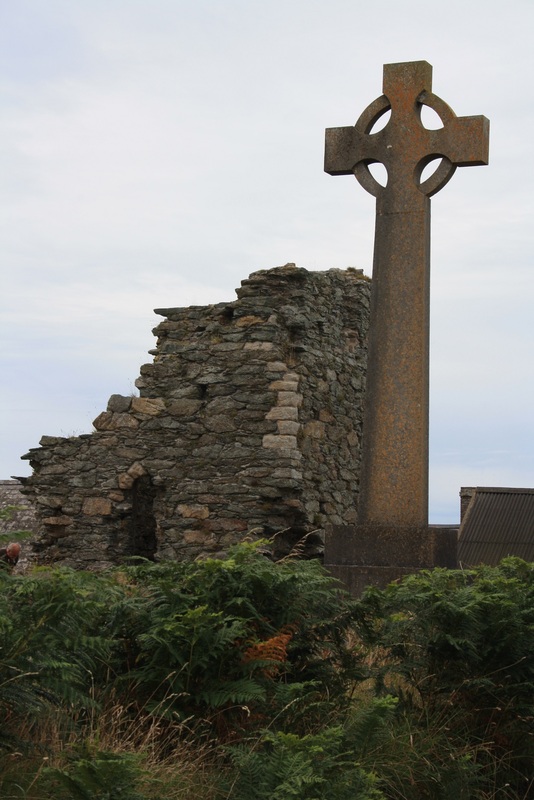 Given the vast number of saints who are said to have congregated here, many of whom have left their names on chains of wells across the mainland, it seems a little surprising that none have been associated with specific wells on the island. At least in naming terms, although of course it is possible that names have been lost and traditions forgotten over time. Of course there are wells here for which healing and miraculous powers have been claimed, but then I think we should expect nothing less in this special place. Surprisingly little information is readily available concerning the stories of the wells on the island, and some of what was available was quite confusing. The Royal Commission Survey of 1964 identified just one well of note which they write up as “unnamed well”. 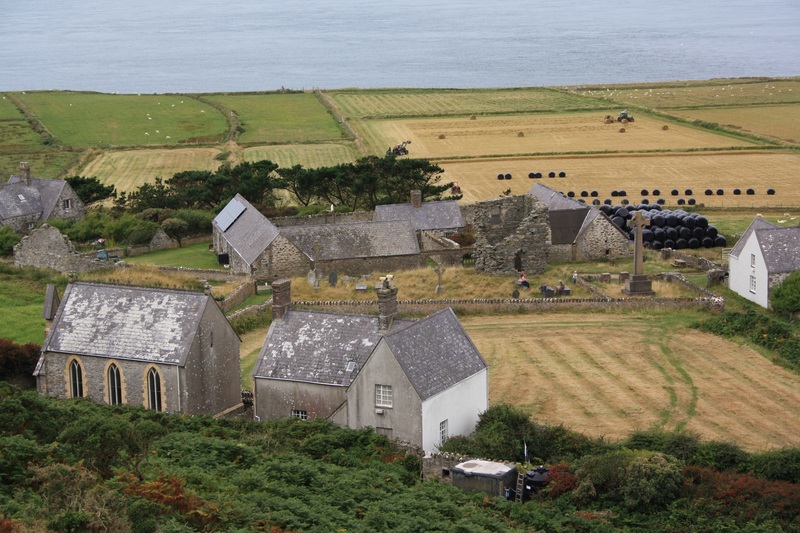 The Coflein database calls this Bardsey Island well and also records Ffynnon Corn. The two are said to be close to each other and this location was our first destination on arriving on the island. 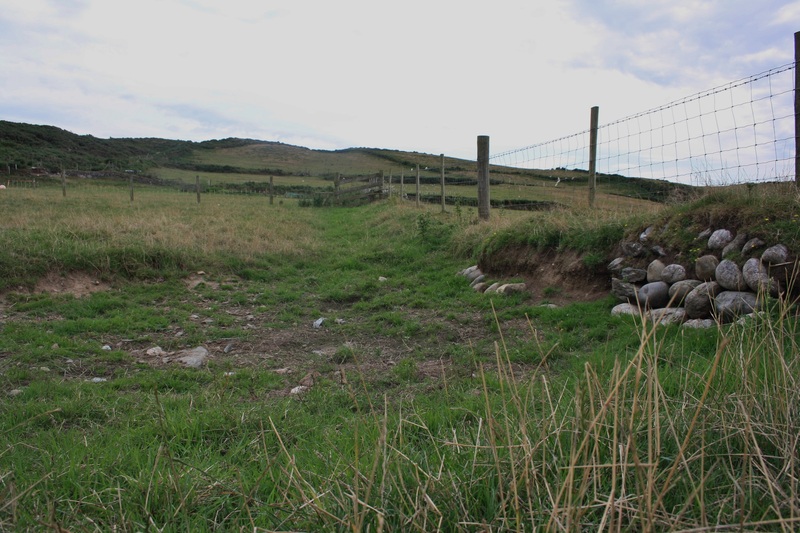 The primary well on the island that which probably served the monastery and which still provides the water source for many of the houses is Ffynnon Corn. We find it close to a path leading up Mynydd Enlli from behind the Victorian chapel close to the abbey. Still an important water supply it has a bright green plastic lid fitted over the square well basin. It is surrounded by a small wire fence for protection. It lies at the base of a small rocky outcrop and there are signs of earlier stonework at the foot of the rocks. The section below the water level is lined in stone, although it has been built up higher at the top in brick. A man working close by came across to see what we were doing and confirmed this as being Ffynnon Corn. He knew nothing of any second well lying close by, which judging by the grid reference should have been a little to the left and higher up the hill. Using GPS to find the location given by Coflein we found it to lie deep beneath an area of bramble and gorse. 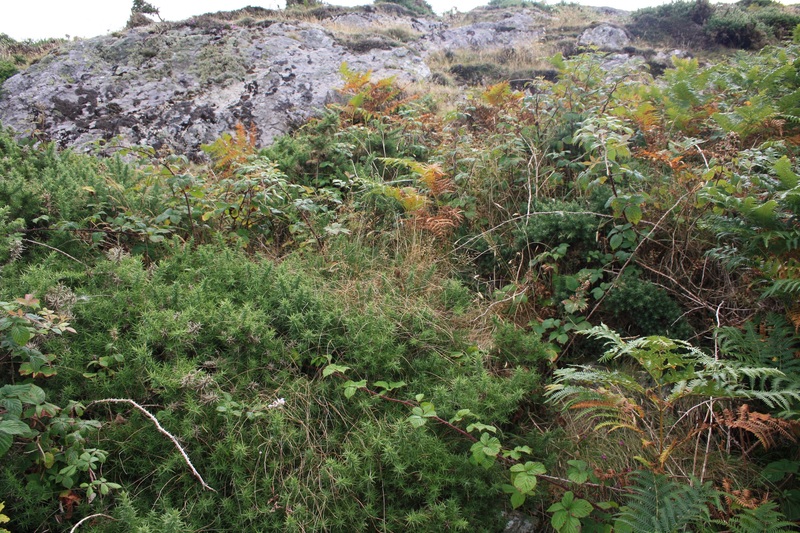 To be fair, the described rocky outcrop stands clearly above the given location, but half an hour of trampling down branches and getting totally scratched revealed no sign of a well or remains of surrounding masonry. The well we were told was Ffynnon Corn actually wasn’t. We saw the second well (although at an incorrect grid reference) and Ffynnon Corn was actually lower down the hill. Another Ffynnon Corn existed 100 years ago, and the name has now been transferred to this site. We did note a number of smaller, apparently less significant springs on the land between the abbey and this well, and perhaps any of these options are feasible. Our other main source of information was a useful illustrated sheet produced by the Bardsey Island Trust and available on their website. This names and describes seven wells, and provides a record of several more which are not located. This too describes Ffynnon Corn and also names a second nearby well as Ffynnon Owain Rolant or Ffynnon Uchaf. 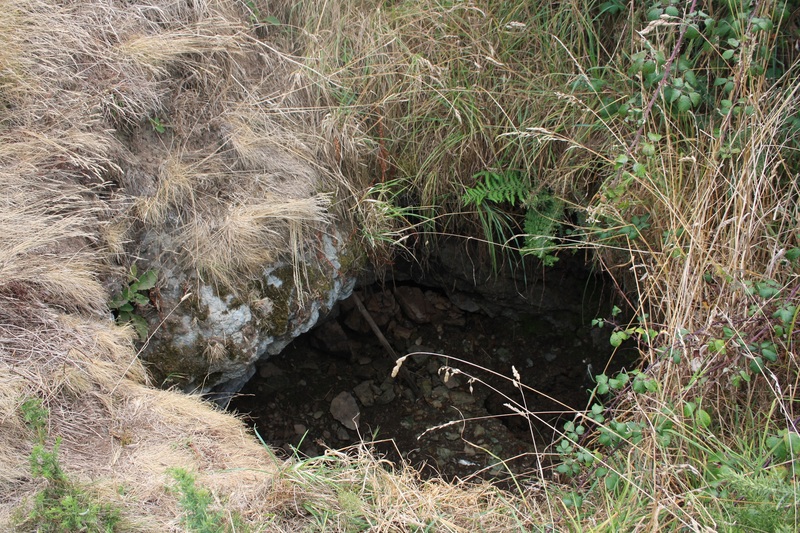 This again provides another strong hint that there is a second well above Ffynnon Corn, but tellingly this is the only well described on the sheet for which a photograph is not provided, we can only assume that they too failed to find it. The sheet does point out that for this well there is “some evidence that it has medicinal powers”. Williams (1979) however suggests that Ffynnon Owain Rolant is higher on the mountain, closer to Ffynnon Barfau – which we didn’t have time to go looking for on this visit; again giving the tradition of some medicinal virtues for the well. Heading back towards the ferry, and more importantly an enterprising farm that provides coffee and cake in its garden, we pick up another three wells from the Island Trust information sheet. Ffynnon Bryn Baglau lies beside the main road through the island on a raised area of land known as Bryn Baglau. Baglau is the Welsh word for crutches and hints at its reputation. 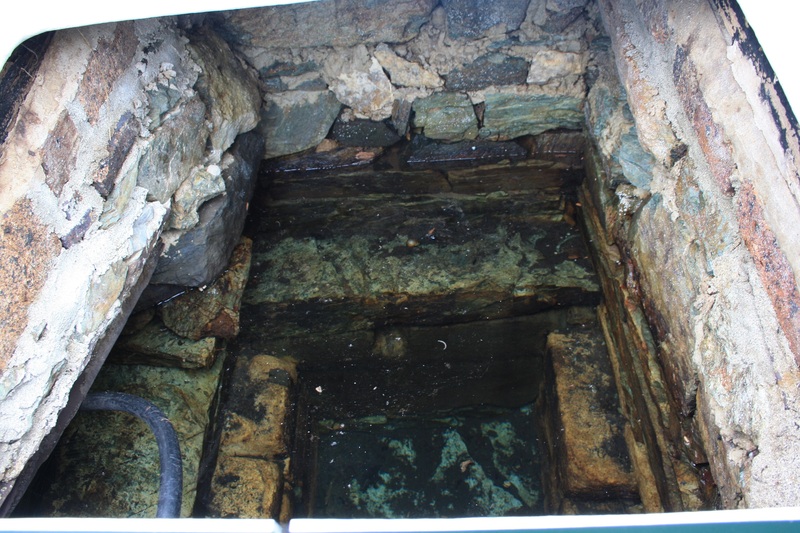 The story goes that people would leave their crutches beside the well after having been cured by its water. The tradition apparently leading back to the story of a notable feud between Saints Cadfan and Lleuddad which was settled through the tactical application of crutches on one another at the site. 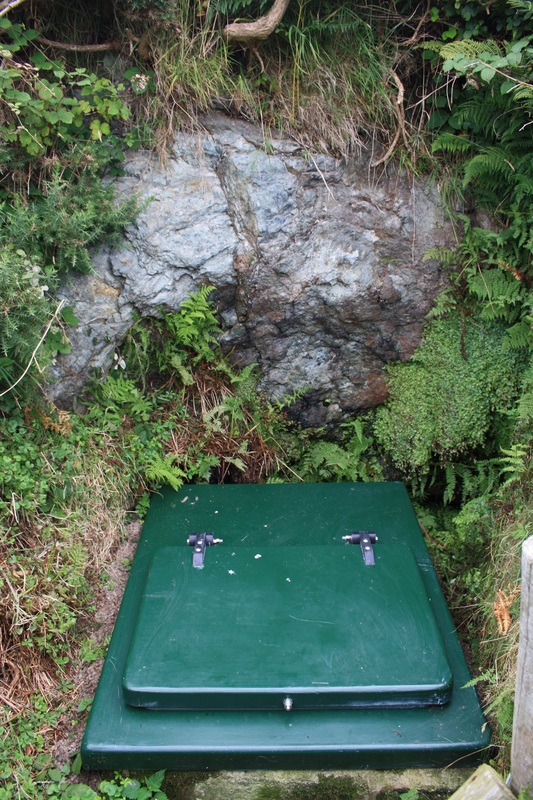 Baglau is apparently a relatively recent name for the well, it has also been known as Ffynnon Dalar and a cottage named Dalar once stood close by. The pictures show the feature we concentrate on at the site, a deep dry hollow, but in retrospect it doesn’t look that spring like even though we wer told locally that the spring is usually dry in the late summer when we were there. Maybe I should have been concentrating on the area in the nearby bushes – a return visit to re-examine this location is definitely called for. Closer to the coffee break is Ffynnon Weirglodd Bach. The information sheet tells us that this also has a reputation as a holy well without going into any more detail.. On our visit it was dry, and is at best nothing more than a muddy hollow, the stones in the bank identify its location in a field called Cae Ffynnon. Close to the ferry landing we find Ffynnon Dolysgwydd. This is an active spring jsut above the shore. 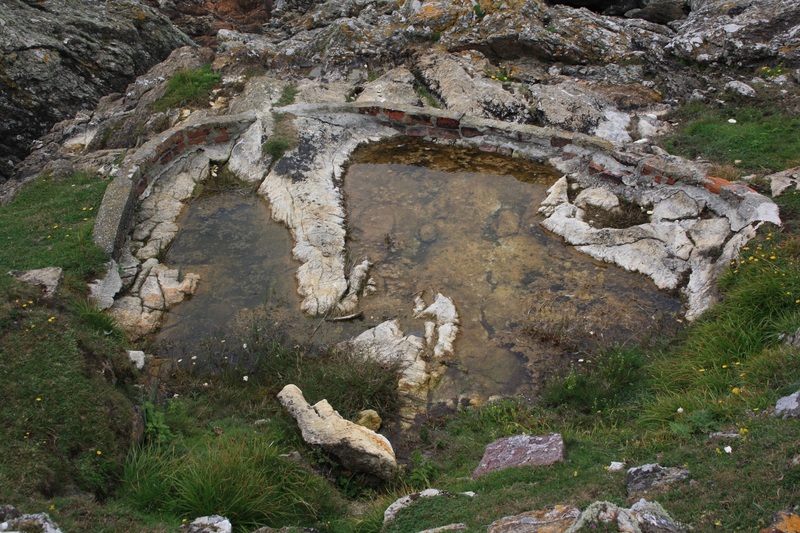 The rock beside the outflow has been ringed around with a course of bricks to form a shallow circular pool. Again the information sheet informs us mysteriously that “it is sais a number of miracles have happened here” without going into any further detail. Our visit to Bardsey, as so often, raises as many questions as it answers. At least one return visit is inevitable and I hope that we can do this journey again soon. In the meantime I would love to hear from people who can shed light on which is the real Ffynnon Corn and is there a second healing well close by. And what of the legends surrounding the other wells? The miracle bringing Ffynnon Dolsysgywd, the holy Ffynnon Weirglodd Bach or any of the other named but not located wells on the island. I knew before we went that this island at the edge of the world had so much history for its size and this fleeting visit demonstrated just how long it would take to discover even a part of it. 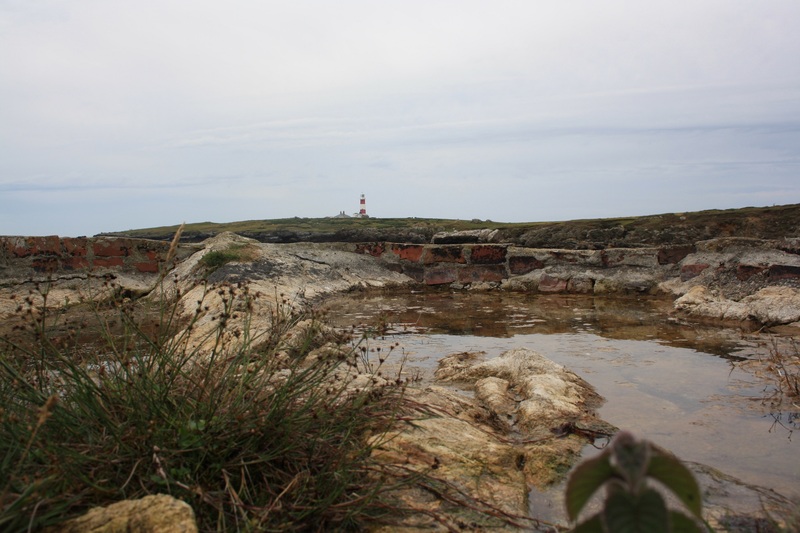 Wells on Bardsey, Bardsey Island Trust.